Major League Baseball star pitchers Clayton Kershaw of the Los Angeles Dodgers and Stephen Strasburg of the Washington Nationals last only two innings amid major injury fears. Los Angeles Dodgers starting pitcher Clayton Kershaw pitches in the second inning against the Atlanta Braves during their MLB game at Dodger Stadium in Los Angeles on July 23, 2017. 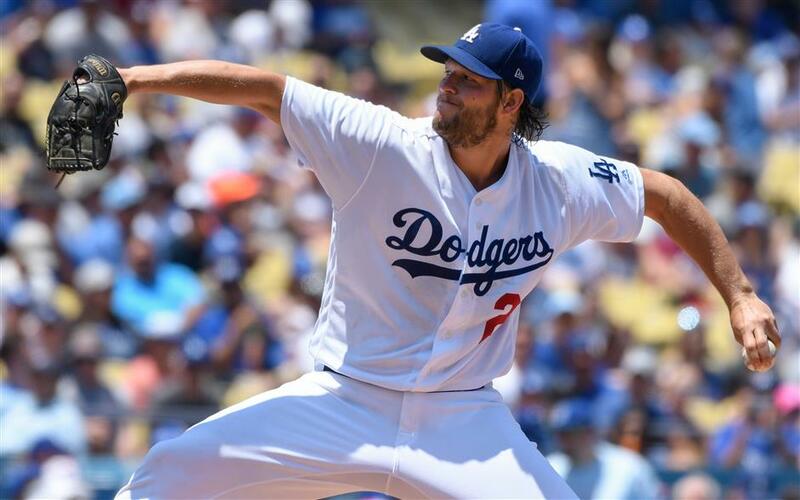 Major League Baseball star pitchers Clayton Kershaw of the Los Angeles Dodgers and Stephen Strasburg of the Washington Nationals lasted only two innings in Sunday starts over major injury fears. The Dodgers, who own the best record in the majors at 68-31, edged the visiting Atlanta Braves 5-4 in 10 innings but 29-year-old left-handed ace hurler Kershaw left the game after two innings with lower right back tightness. "I'm not optimistic just because I got taken out of the game," Kershaw said. "At the same time, some of the symptoms aren't as bad as they could be. Hopefully find out more." The Nationals, who led the National League East division with a 59-38 record, won 6-2 at the Arizona Diamondbacks but 29-year-old right-hander Strasburg was pulled off the mound early by what Washington manager Dusty Baker termed right arm tightness. "I think it's something I can work through," said Strasburg, saying it felt like a forearm injury and not his previously repaired elbow. "Let's address it and clear it out. I just want to be there in the end (of the season). If coming out after a couple of innings today puts me in a better position to do that, I'll take it." His injury-nagged career included Tommy John tendon replacement that required a year of rehabilitation and he was shut down late in a title-contending season over concerns he had pitched too many innings. Dodgers manager Dave Roberts said Kershaw will be placed on the 10-day disabled list no matter what tests show and added the setback could be muscular in nature. Kershaw is a three-time NL Cy Young Award winner as top pitcher as well as the 2014 NL Most Valuable Player. Last season, Kershaw missed 2 1/2 months with a herniated disk that didn't require surgery. "I don't want to compare because there's so many variables," Kershaw said. "I don't even know how to compare it, honestly." Kershaw said he felt something different on his final warmup pitch in the second inning. "It was a little concerning when we saw him grimace on the mound," said Dodgers second baseman Logan Forsythe. "We understand it's not as bad as it was last year. It was a smart move and precautionary to get him out of there and see where it's at." Kershaw's early exit struck fear in the hearts of Dodgers fans with the club leading the NL West division by 10 1/2 games and dreams of the team's first World Series title since 1988. "Every time a guy like that goes down, it makes you sick to your stomach," said Dodgers relief ace Kenley Jansen, who squandered his first save opportunity in 25 appearances this season. "Man, hopefully everything is all right." Kershaw struck out two batters, walked one and didn't allow a hit or run over 21 pitchers before exiting. He has a 15-2 record with a 2.04 earned-run average and has not lost a start since May 1. Kershaw bounced a curveball in the dirt and was visited by a trainer and Roberts during the second inning with Tyler Flowers at bat. He walked Flowers and then struck out Adams to end the inning, then left for good. "A lot of frustration," Kershaw said. "Just countless hours of back maintenance and rehab just trying to stay healthy. Felt really, really good up to this point." In Phoenix, an injury to Strasburg is the last thing the Nationals need after adding much-traveled Edwin Jackson as a fifth starter. "We think he's good and we took him out for precaution," Baker said. "He's had a little stiffness and he couldn't get loose, even though he's throwing the ball well. We'll analyze it when we get back home and hopefully we'll have an answer on Tuesday." Strasburg said his pitching routine was thrown off two weeks ago by the mid-season All-Star Game break. "It's not intense pain, it's just general and kind of tough getting loose," Strasburg said. "The All-Star break kind of messed it up for me throwing-wise and treatment-wise. It's taking me a while to get back into the swing of things."